Console metal chrome-plated and golden brass, circa 1970-1980, two shelves, good condition, top glass beveled everything is screw. Sunflower lamp in gilded iron and bronze, 3 flowers, a bulb, the base measures 17 x 17 cm, good condition, circa 1970. Enlightening plant in skated brass, Maison Jansen, brass base, circa on 1970, Good condition. Pair of coffee table with shelf in glass, top in glass, amounts ended with acorns and barrels with cases iron skates typical rifle barrel of this mark Good condition, circa 1950-1970. A Willy Rizzo metal and glass console. Glass and metal frame. Optimum condition. Superb 3-tier console by Maison Jansen, ebonized mahogany and brass galerie from the floor to the 1st tier: 9", To the 1st to the second tier: 13". To the second to the top: 10". 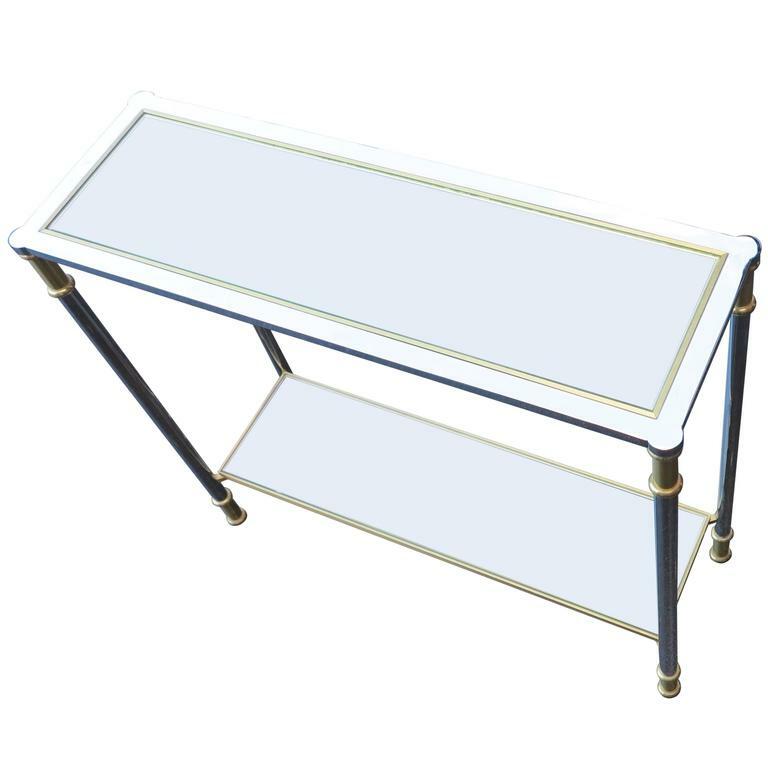 Pair of brass quality console tables with his own original glass shelves Attributed to Maison Jansen. Elegant lacquered console with gold details with a neo-Louis XV inspiration. Stamped AJ (Atelier Jansen) with numbers. circa 1970. Maison Jansen style console table with bronze mounts.